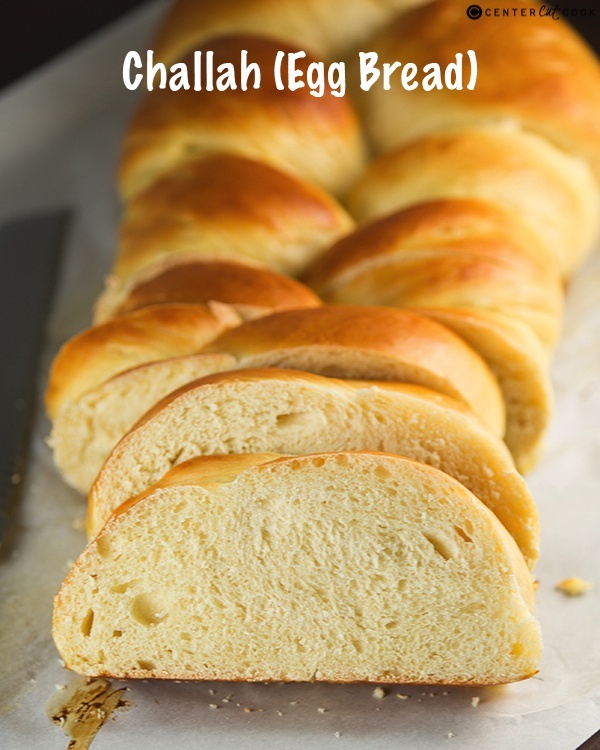 This recipe for Challah, also know as egg bread, is delicious in its own right but it also makes the most phenomenal french toast, french toast casserole, or bread pudding! No bread machine is required for this recipe! There are few things in life that fill me with fear, more than making fresh bread. I’m not talking about the easy kind like banana bread or other similar variations. I’m talking about the kind that you have to show tender love and care to knead. And for that reason, homemade bread that requires kneading generally only makes an appearance in this house a few times per year because it stresses.me.out. Despite the fact that I absolutely love the aroma of fresh bread in my house, I’m always nervous to attempt making a loaf for fear that it will turn into a disaster. What if the dough doesn’t rise? What if the bread browns unevenly? What if the bottom burns? Today I decided to not let bread intimidate me and tackle Challah Bread, a type of bread I haven’t ever tried making before. The teacher in me feels it necessary to give you a quick lesson on what Challah is. 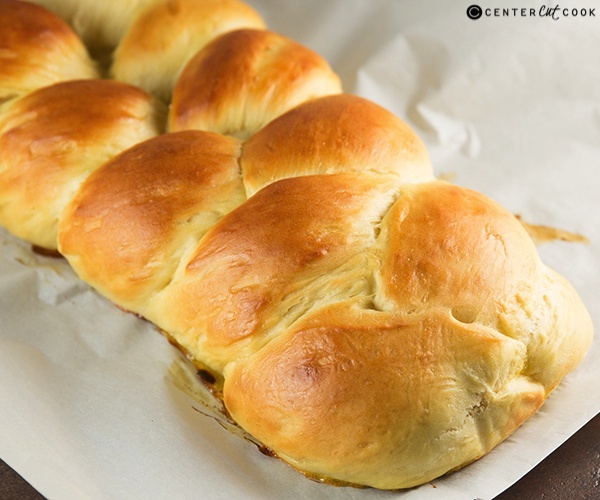 Challah is traditionally eaten by Jews on the Sabbath. It’s usually braided, and has several eggs in it (hence its nickname of Egg Bread). Sometimes it’s in loaf form, other times you’ll see it in braided rounds. Sometimes there are raisins in it, other times it’s coated with poppy seeds. The only thing you must remember from this quick little lesson is that Challah is darn tasty. Darn tasty I tell you. Now, I will be the first to tell you that my Challah is far from the most beautiful loaf out there, in fact, if I’m comparing mine to others, it would probably come in last place as far as looks go! There are loaves of Challah out there that have six, yes six strands braided together and they are stunning…. in a bread kind of way. I kept it simple, and since this was my first time making this type of bread, I did a three strand braid which turned out to be easy-peasy lemon-squeesy. PS: This recipe yields one super delicious loaf of Challah. Next time I plan to double the recipe so that I get two loaves for the effort of one. Because it does take some effort… but it’s worth it! In a large bowl (I used my food processor for this part) pour warm water. Add in yeast. Whisk in honey, oil, 1 egg and 3 egg yolks. Add in salt. Begin adding one cup of flour at a time, mixing after each addition. After you’d added the fourth cup of flour, begin kneading with your hands on a floured work surface. Continue adding small amounts of flour into the dough as you knead, until the dough is no longer sticky. Place the dough in a large bowl, and cover it with a damp towel. Allow it to rest for about 1.5 hours. After about an hour and a half, place the dough on a work surface that you’ve sprinkled with flour. Punch down the dough (literally punch the dough). Knead the bread for about 5 minutes longer (I cheated and did about 3). Next, divide the dough into three even sections (or 6 if you’re doing a 6 strand challah). Use your hands to form each section into a 12 inch long strand that is about 1.5 inches in diameter. Pinch the ends of the strands together at one end, then begin braiding the dough, just like you would braid hair. Bring the left piece over the middle, then bring the right piece over the middle. Continue until the whole loaf is braided, then pinch the ends together. 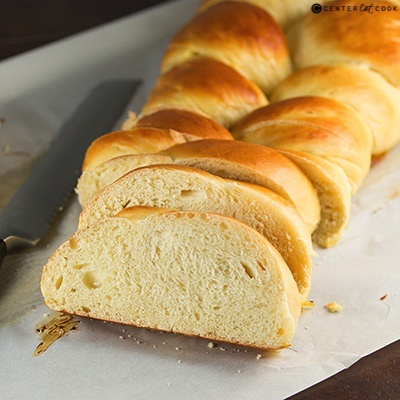 Grease a large rimmed baking sheet and place the braided loaf on the pan. In a small bowl whisk together one egg and 1 tablespoon honey. Brush the egg wash all over the bread. Cover the bread with a damp towel and let it rise for one more hour. 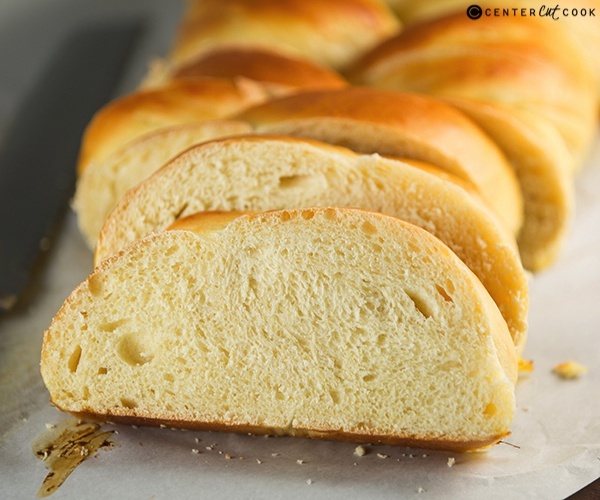 Brush the Challah again with the egg wash, then place in the oven for 27-32 minutes. Keep a close eye on the bread so that it does not burn. Internal temperature should be about 190 degrees.